1. Bar mark, which indicates the right position of the bar in a structure. 2. The diameter of the bar. 3. The shape of the bar. 4. 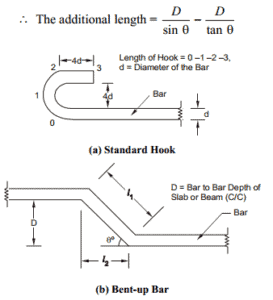 The dimension of bending of the bar. 5. The number of same bar types. 6. The length of all bars. From BBS we can know the reinforcement of different bar sizes and bars are cut and bent appropriately at the job site. It also ensures proper checking and completion of estimates in a short time. The dimension of bends should be so given in the BBS that minimum calculation is required for the making of bars and furtherly setting the machine and stops. 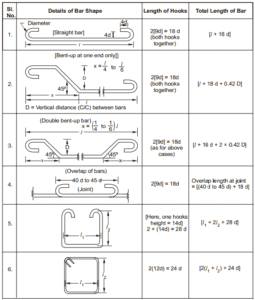 The length of hooks and the total length of a given steel reinforcement is achieved by the following method. Isn’t there some heavy machines as bar benders available in market for this? Very good presentation Sir. What is the cutting length in BBS ? How rod cutting length is calculated in site ? What is the K value for U hook & L bend ? Please explain these.